Are there any particular ways in which to maximize the function of the 9314-M? What about the other 9314's? What about the 9312? Not sure what you're asking. The 9314 nibs are obliques, and the 9312 is an italic (and damned hard to get hold of -- I think I've only seen one on a pen, and never for sale). Opinions differ as to whether obliques are designed for people who tend to roll their pens (so the nib's tip will still be flush with the paper), or whether obliques are designed to get line variation (somewhat like the way italic nibs do, i.e., with vertical and horizontal lines at different thicknesses). I have some Esterbrooks with 9314 nibs, but haven't tried them. I also have a couple of other pens with oblique nibs (a Parker 45 with an OF nib and a Parker 51 with an OM or OB nib, plus a vintage Pelikan 400 with an OB nib. Don't have much in the way of plain italics, except for a Sheaffer calligraphy set I bought myself a number of years ago and have since lost the IM nib, and a Parker Vector calligraphy set for which I've only used the IF nib. Well, I have a 9314-M and a 9312, but have not used them yet. 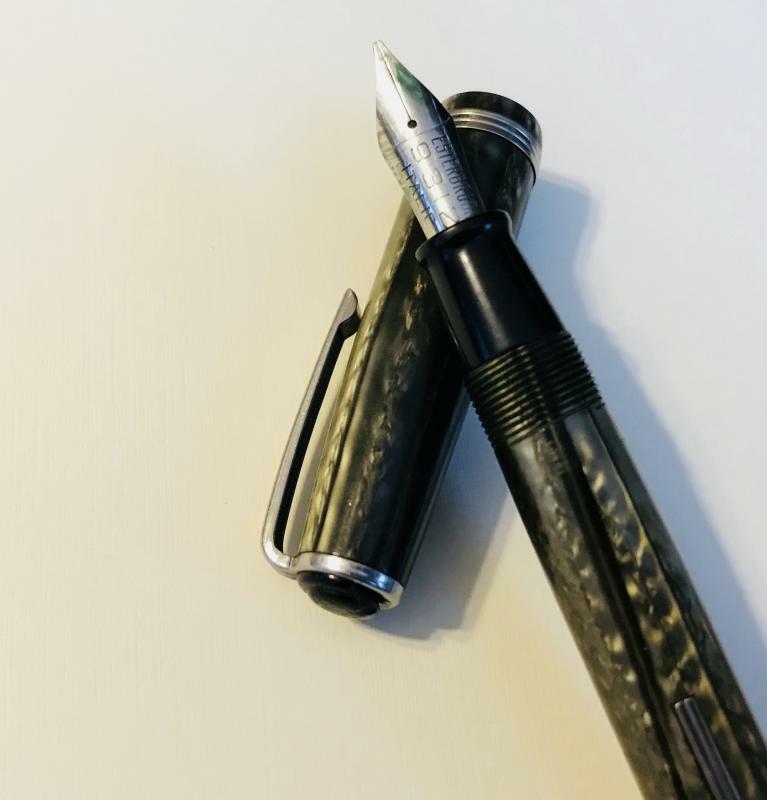 I really like the 9550 & 9555 for daily use and my planner, but love the way some nibs are able to capture a nice, thin and crisp line, while also offering the unique characteristics of a thick vertical or diagonal line through natural use. When using a 2668, the lines are really full, fuller than I am accustomed to using(Precise V5). I am sure if I was using a broad, the lines would be even fuller. Looking at the nib points, it is obvious that it will take some practice. I really am new at this and it could be I am out of my element, but I'd like to give it a go. Here is the 9312 on a nice looking Green(Dark Fern) that I picked up because of the pen color and later learned it was a nice nib. I also found a 9048 in a Foliage transitional J, but the nib is pretty well damaged and the cap is missing the 3-ridge jewel and clip. I have read that it's a solid nib too. What I'd like to know is if there is a particular way to write with either 931x nib. I don't understand what you mean by "optimize" here. I have 9314-F fine nibs, 9314-M medium nibs and 9314-B broad nibs. I didn't get the "rotating the pen" thing as a rational action. If you hold the pen straight so the nib is at an angle like the toes of a left foot (it is a left oblique) you will get whatever line variation a stub would provide. If you rotate the pen, you get a wider sample of the same kind of result. Note that the 9314s are stub nibs, and not italic nibs like the 9312 and 2312. The 9312 and 2312 are about a medium italic with edges somewhat sharp. Not really sharp like some italics. Lucky you. I chased that nib for about a year. The one I found was NOS for $37. It isn't new, but looks like its in good condition. I will be lucky if I can learn to use it effectively and well. I put a new sac on the pen today so I'll let the shellac set over night and load the pen tomorrow. Would it be helpful to soak the nib in water tonight so I flush it tomorrow, before loading the pen with ink? So, I loaded up the 9314-M and it writes a bit differently than the 9312. Why does it drop & start as it does? 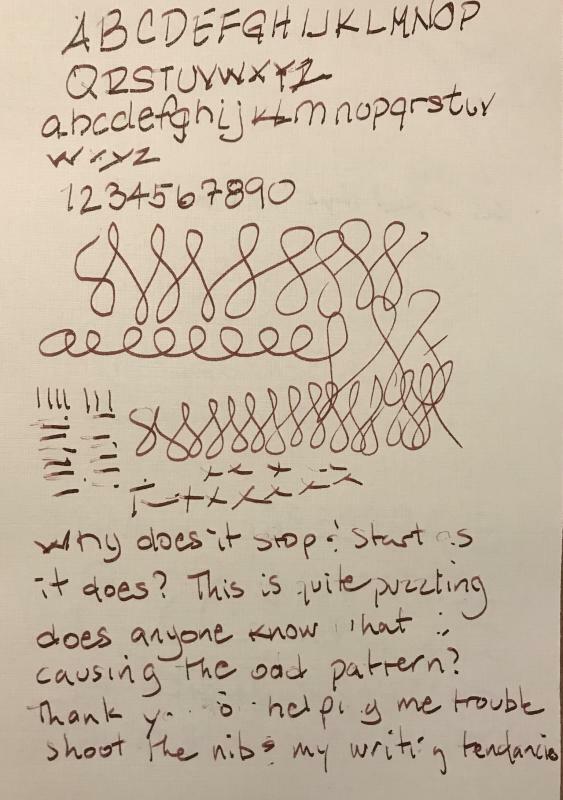 This is quite puzzling, does anyone know what is causing the odd pattern? Thank you for helping me trouble shoot the Nib & my writing tendencies. 9314-M is a stub. Stubs have a more rounded off edge than italics, like 9312 italics have, so the line variation obtained with the 9312 is more pronounced than the line variation obtained from a 9314-M. 9314 is an oblique stub, refered to by Esterbrook as Relief. The writing irregularities you are noticing are flow interruptions caused by dried ink or possible misalignment of the nib. I would suggest flossing the nib and checking nib alignment as first steps. Also consider the ink, and you might try a wetter ink. Some one else might advise on ink. Edited by pajaro, 17 August 2018 - 11:09. Would placing a nib in an ultra-sonic cleaner be a bad idea? What would misalignment look like? I don't have an ultra sonic cleaner, so I can say, but many people here use them in this way.